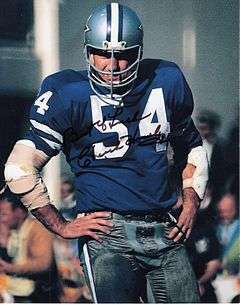 Charles Louis "Chuck" Howley (born June 28, 1936) is a former American football linebacker who played in the National Football League (NFL) for 15 seasons, primarily with the Dallas Cowboys. Howley was a member of the Chicago Bears in his first two seasons and spent the remainder of his career with the Cowboys. He was named the MVP of Super Bowl V and is the only player on a losing team to receive the award. Born and raised in Wheeling, West Virginia, Howley attended Warwood High School and graduated in 1954. He lettered in football, High school basketball, and baseball. In football he was first team all-state and all-OVAC as a senior. As a teenager he competed in gymnastics. He played college football at West Virginia University in Morgantown, where he was a three-time All-Southern Conference selection and the conference player of the year in 1957. He is the only athlete in WVU history to letter in five sports: football, track, wrestling, gymnastics, and swimming. He won the Southern Conference one-meter diving championship. Although he started in 1961 and 1962 as a strongside linebacker, in 1963 he embraced the switch to weakside linebacker, when it was decided that Dave Edwards had more upper-body strength. The move paid off as, at the conclusion of that season, Howley was named to The Sporting News All-East NFL team for the first time. Howley holds the record for most interceptions by a linebacker in a season with six, which he accomplished in 1968. During his career, Howley's athletic ability made him one of the greatest coverage linebackers of all time, intercepting 25 passes, returning them for 399 yards and two touchdowns. He finished with more than 100 yards in interception returns for both the 1968 and 1971 seasons. He also recovered 18 fumbles, returning them for 191 yards and one touchdown. He is second in Cowboys' history with his 17 fumbles recovered. His 97-yard return of a fumble during a game against the Atlanta Falcons on October 2, 1966 is still the second longest in Cowboys history. He also had a large number of tackles and quarterback sacks, but these statistics were not compiled until after Howley's career ended so his unofficial sack total is 26.5 according to the Dallas Cowboys with a career high of 5½ sacks in 1965. Howley was named first-team All-Pro five times in his career, was a six-time Pro Bowler and was named to the All-Eastern Conference team in 1963. Howley suffered a left knee injury from a crackback block by Charley Taylor in the win over rival Redskins late in the 1972 regular season. He missed the playoffs and retired in June. In 1973, he made a brief return to the team and appeared in one game, before retiring for good. His thirteen seasons for the Cowboys ties him for the second longest tenure in franchise history. In 1977, Howley was inducted into the Ring of Honor at Texas Stadium, the fourth player to receive that honor. He also was inducted into the Texas Sports Hall of Fame. The Professional Football Researchers Association named Howley to the PRFA Hall of Very Good Class of 2006  In 2007 he was among the 17 finalists to be seniors candidates for the Pro Football Hall of Fame. Following retirement, Howley ran a uniform rental business in Dallas and is now involved in a foundation dedicated to breeding quarterhorses at Happy Hollow—located in Wills Point, Texas. His broodmare herd consists of more than 50 mares. He lives in Dallas. ↑ "West Virginia's Howley All-Southern '11' captain". Milwaukee Sentinel. Associated Press. November 30, 1957. p. 4, part 2. ↑ "Midwest Dominates North Team". Retrieved February 19, 2016. ↑ Johnson, Chuck (August 16, 1958). "Grid All-Stars slay inept Detroit Lions". Milwaukee Journal. p. 12. ↑ "Ohio Valley Athletic Conference hall Of Fame". Retrieved February 19, 2016. ↑ "Bears lose linebacker". Milwaukee Sentinel. UPI. August 12, 1959. p. 3, part 2. 1 2 "Cowboys sign Howley, ex-Bear". Milwaukee Sentinel. Associated Press. June 14, 1961. p. 2, part 2. ↑ Mayer, Larry (25 April 2013). "These Bears draft picks gained fame in other areas". Chicago Bears. Retrieved 25 April 2013. ↑ "Mind-blowing stats for Week 5 of the 2013 NFL season". National Football League. 2 October 2013. Retrieved 3 October 2013. ↑ "Dallas Dumps Dolphins". Retrieved February 19, 2016. ↑ "Chuck Howley Retires From Pro Football". Retrieved February 19, 2016. ↑ "Illegal blocking claim irks Dallas' Alworth". Victoria Advocate. Texas. December 13, 1972. p. 2B. ↑ "Dallas playoff-bound without Howley". St. Petersburg Times. Associated Press. December 11, 1972. p. 4C. ↑ "Injured Howley mum concerning retirement". Victoria Advocate. Texas. Associated Press. December 12, 1972. p. 1B. ↑ "Dallas' Howley ends retirement". Wilmington Morning Star. North Carolina. UPI. September 19, 1973. p. 3C. ↑ "Hall of Very Good Class of 2006". Retrieved November 23, 2016.